The University of Mississippi’s McLean Institute for Public Service and Community Engagement welcomed a new group of outstanding students from around the globe this fall, representing majors from across the university. First row from left, Albert Nylander, Hannah Newbold, Navodit Paudel, Kristina Fields, J.R. Love, Laura Martin; second row from left, Michael Mott, Allison Borst, Zachary Pugh, Joshua Baker, Kendall Walker, Curtis Hill; third row from left, Bryce Williams, Elena Bauer, Adam Franco, Arielle Rogers, Virginia Parkinson, Anna Katherine Burress, Ashley Bowen. A grant from the Robert M. Hearin Support Foundation for the University of Mississippi’s McLean Institute for Public Service and Community Engagement will fund research and service aimed at increasing community and economic development in Mississippi communities. The McLean Institute welcomes a new group of outstanding students from around the globe this fall, representing majors from across the university. This scholarship opportunity serves to build actionable partnerships across the state to promote entrepreneurship and economic development. Albert Nylander, director of the McLean Institute, professor of sociology and principal investigator for the Catalyzing Entrepreneurship and Economic Development, or CEED, program, said he is thankful for the approximately $500,000 provided by the foundation. “The wonderful people at the Hearin Foundation continue their remarkable record of supporting university students through fellowships to make a difference throughout Mississippi,” Nylander said. 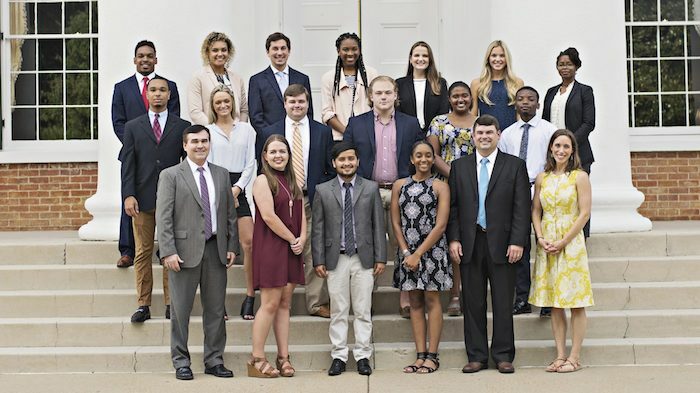 Fifteen students were selected this year to continue a nearly $2 million McLean Institute investment from the Hearin Foundation to bolster community and economic development in Mississippi. This grant will support UM students through 2021. The CEED Initiative works with UM students and faculty to implement projects and conduct research that directly affects Mississippi communities. These students join a network of more than 50 UM students and faculty, as well as a collaboration of more than 400 community and business leaders in the state, who embarked on the first CEED project in 2014-18. The annual entrepreneurship forums, business webinars, youth leadership programs and other activities are focused on spurring economic growth in the state. “We are thankful to the Robert M. Hearin Support Foundation for providing the opportunity to continue working in Mississippi with business and community leaders in partnership with UM students to help move our state forward,” said J.R. Love, CEED project manager. The program’s annual Mississippi Entrepreneurship Forum, which helps strengthen the state’s entrepreneurial ecosystem, will take place March 8, 2019, at Millsaps College in partnership with other universities throughout the state. The CEED program supports undergraduate and graduate students and faculty members to research poverty, education, asset building, and health care in Mississippi. The McLean Institute also supports faculty research projects through the CEED Initiative. Cristiane Surbeck, associate professor of civil engineering; Kate Centellas, Croft associate professor of anthropology and international studies; David Holben, professor of nutrition and hospitality management; Tejas Pandya, assistant professor of mechanical engineering; and Annie Cafer, assistant professor of sociology, all have received funds to conduct projects in Mississippi. The 2018-19 CEED program includes students from the College of Liberal Arts and the schools of Accountancy, Applied Science, Business Administration, Engineering, Journalism and New Media, Law and Pharmacy. Other students in the program are: Josh Baker, a junior majoring in economics from Katy, Texas; Elena Bauer, second-year law student, Freiburg, Germany; Allison Borst, junior in biological sciences and sociology, Madison; Anna Katherine Burress, junior in pharmaceutical science, Water Valley; Kristina Fields, junior in psychology, Belden; Adam Franco, senior in public policy leadership, Birmingham, Alabama; Michael Mott, junior in integrated marketing communications and Spanish, Chicago; Hannah Newbold, junior in integrated marketing communications, Roswell, Georgia; Virginia Parkinson, sophomore in marketing and corporate relations, Oxford; Navodit Paudel, junior in general business, Dhading, Nepal; Zach Pugh, sophomore in public policy leadership, Oxford; Arielle Rogers, sophomore in accountancy, Guntown; Kendall Walker, junior in communication sciences and disorders, Tupelo; and Bryce Williams, master’s student in exercise science, Ridgeland. For more information on the McLean Institute for Public Service and Community Engagement, visit http://mclean.olemiss.edu/ or contact Albert Nylander at 662-915-2050, or nylander@olemiss.edu.